ESP Auto Inc., Services: Brakes | ESP Auto Inc. Your brakes are one of the most important components in your car but do you know how they actually work? 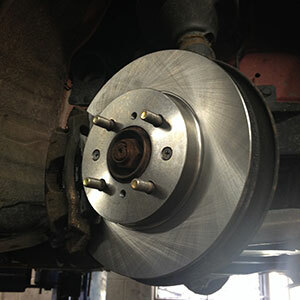 In a typical car, the braking system is made up of disk brakes in front and either disk or drum brakes in the rear. Tubes and hoses connect them and link the brake at each wheel to the master cylinder. When you step on the brakes, a plunger is pressed in the master cylinder, which forces brake fluid to the braking unit for each wheel. If you have disk brakes, the brake fluid then travels into a caliper, on its way to a piston. The piston then forces a pair of brake pads against the rotor. This is what causes your vehicle to decelerate or stop. Think of it like a bike: when you pull on the brakes, a pad squeezes the wheel and stops it from turning – it’s the same with your car. Of course, brake pads wear out over time and need to be replaced. So how do you know when it’s time? There are four main signs that it’s time for us to check out your brakes! Some disk brakes have a component called a ‘wear indicator‘ which is attached to the pad. When your brake pad wears down, the wear indicator comes into contact with the rotor and makes a loud squealing sound. That sound is a great indicator that you need to change your brake pads as soon as possible! Also, if your car pulls left or right this could also be a sign of worn brake pads. Of course, pulling or ‘drift’ might be a sign of worn or under-inflated tires, but either way the problem needs to be checked out! Vibrating disks also could indicate brake problems. If you press on the pedal and feel like you’re driving over pea gravel, this is a sign that the rotors may have warped. If the rotors warp, they become misaligned and vibrate against the brake pads – this is the vibration you feel through the pedal. And finally, if using the brake is difficult and you find yourself compensating for its slow response, this is definitely a clear sign that you need to get your vehicle checked out. Contact us today if you would like to schedule an appointment for a brake check!